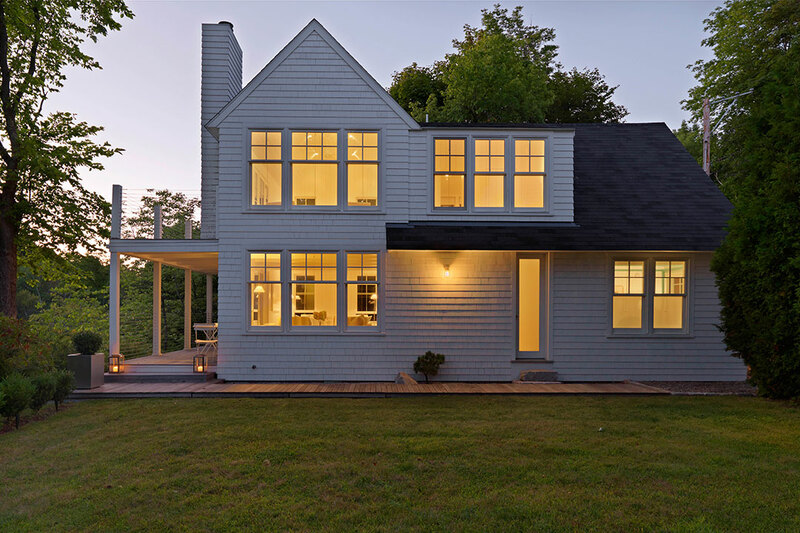 For a young and modern family we were asked to update several rooms of their Dutch Colonial style home using the Art Deco and Mid Century modern styles as inspiration. 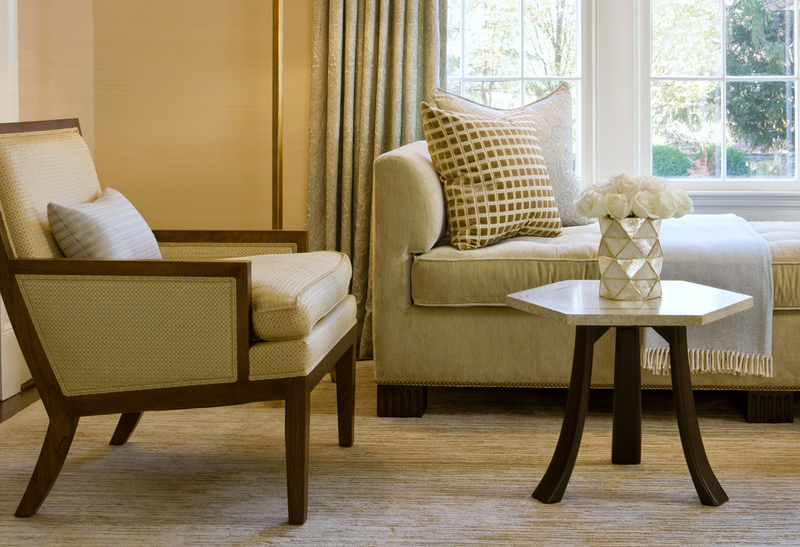 For the living room we created a soothing palette of soft golds, creams and accents of pale blue. 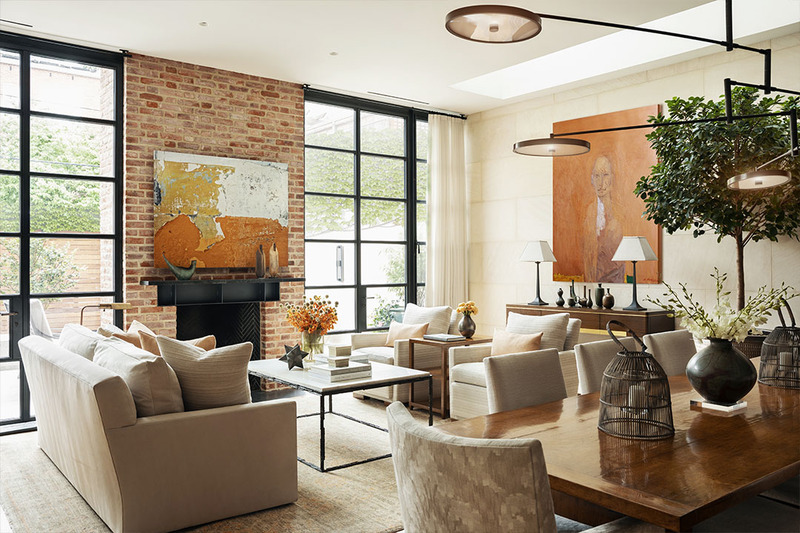 A custom designed limestone mantel transformed the space. 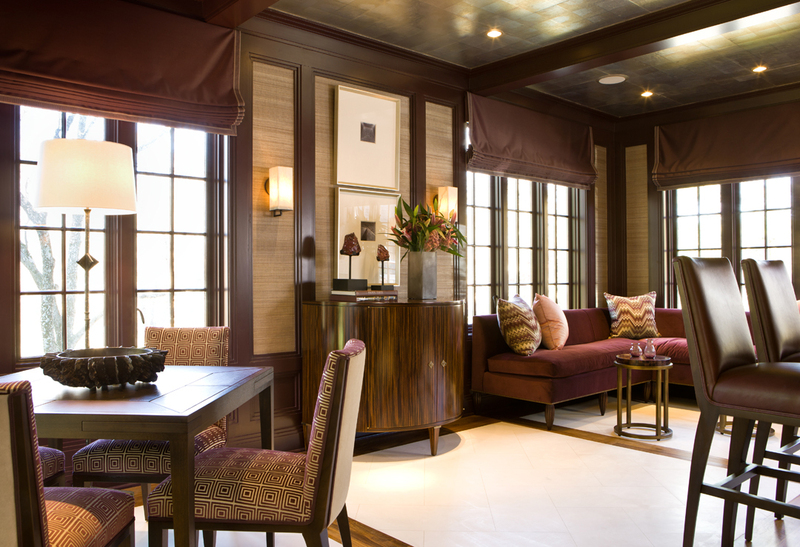 For the dining room and lounge we created a more dramatic color scheme using bronze, aubergine and rich golds infusing the spaces with livable glamour. 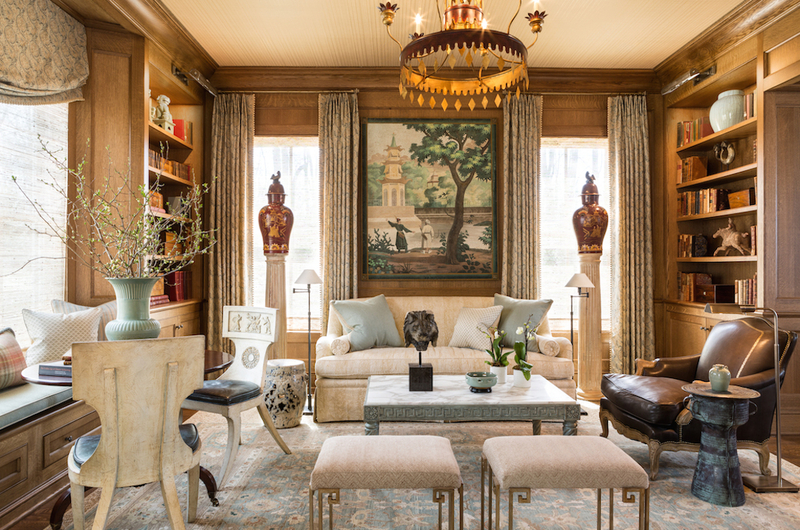 Greek Revival and Farmhouse style elements inspired the direction of this library we designed in Virginia. 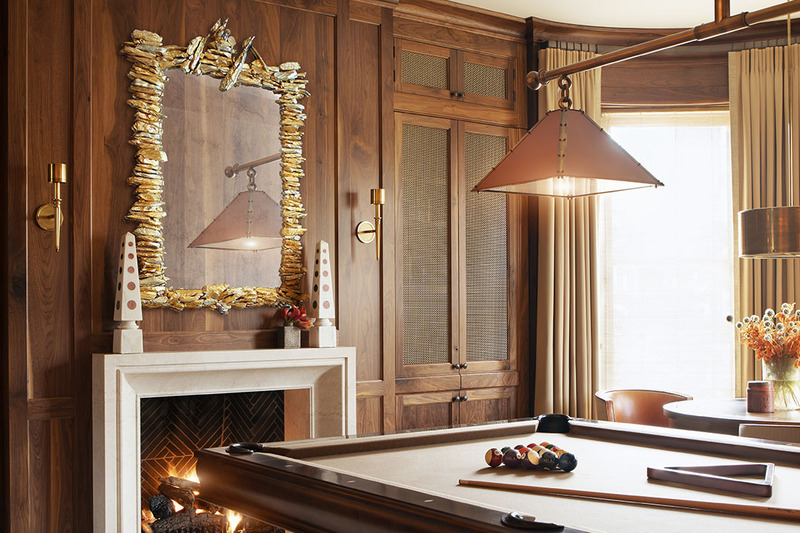 The custom designed bleach oak paneling and bookcases created an elegant yet relaxed backdrop for a mix of classically inspired furniture and accessories. 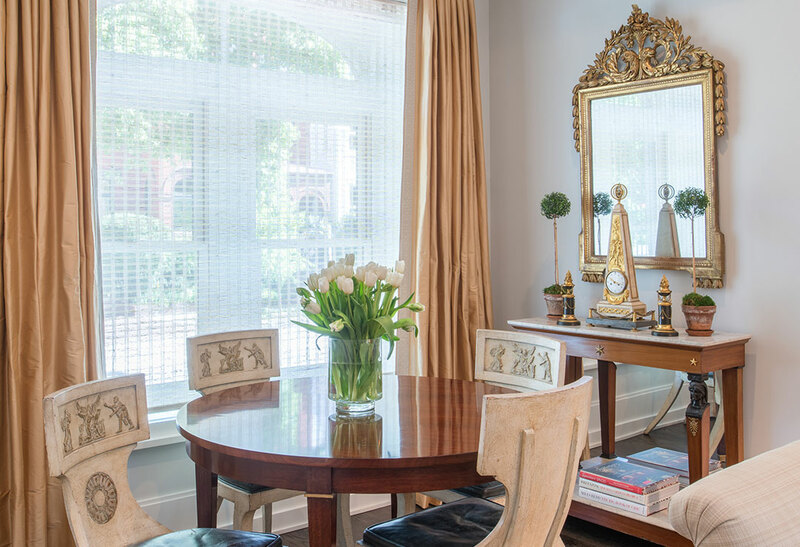 Our overall goal was to create a comfortable, inviting and timeless space. 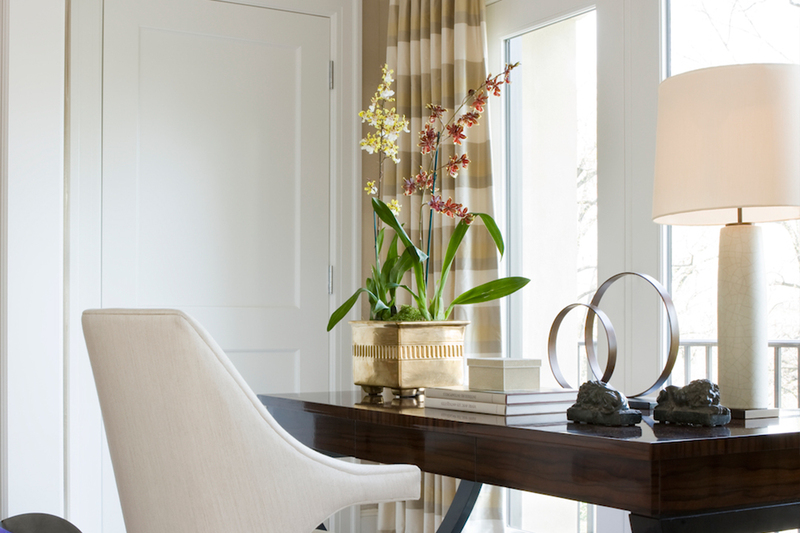 The guest bedroom for the 2010 Washington DC Design House was designed with complete comfort and luxury in mind. 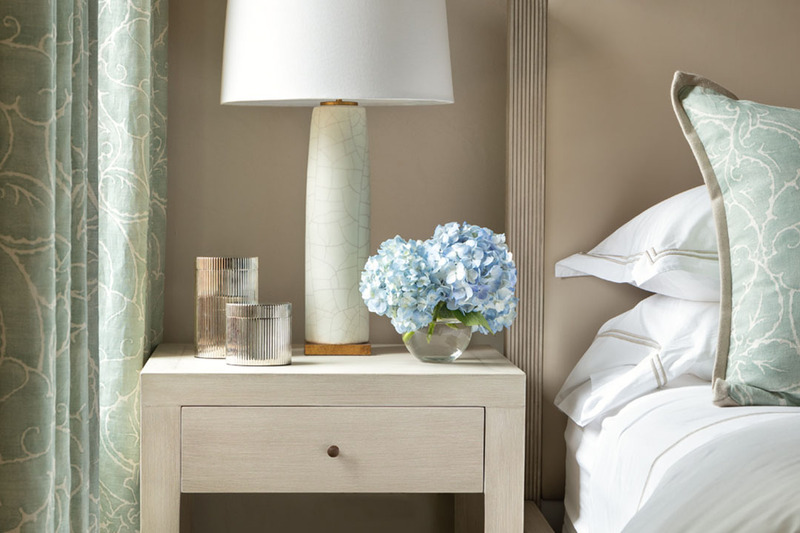 The focal point of the room is a modern steel and wood canopy bed flanked by more traditional side tables. 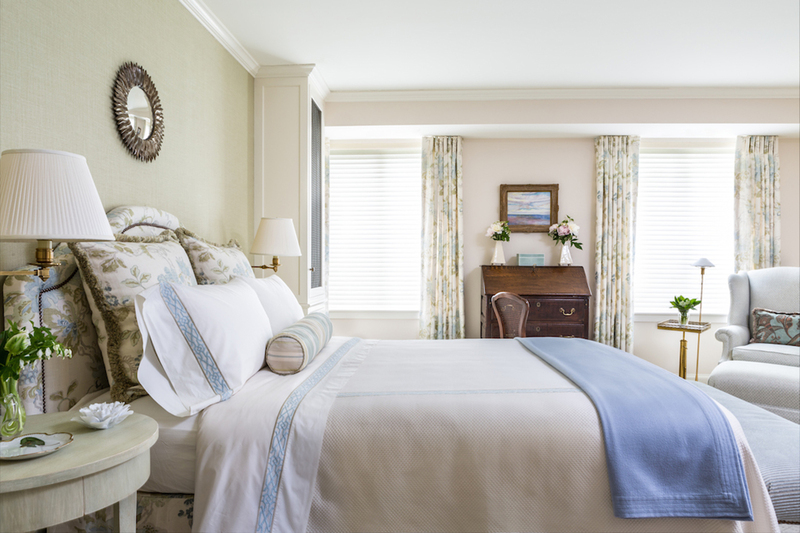 A soft backdrop of draperies was created while concealing the center window allowing us to center the bed in the space. 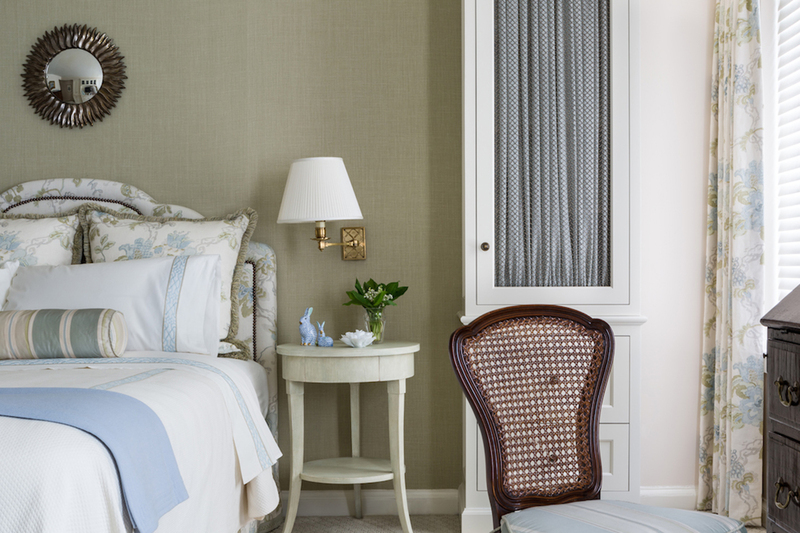 The walls were lined in a delicate, floral pattern fabric accented with pale blue passementerie. A custom designed, laser cut cow hide rug provides softness and durability under foot. 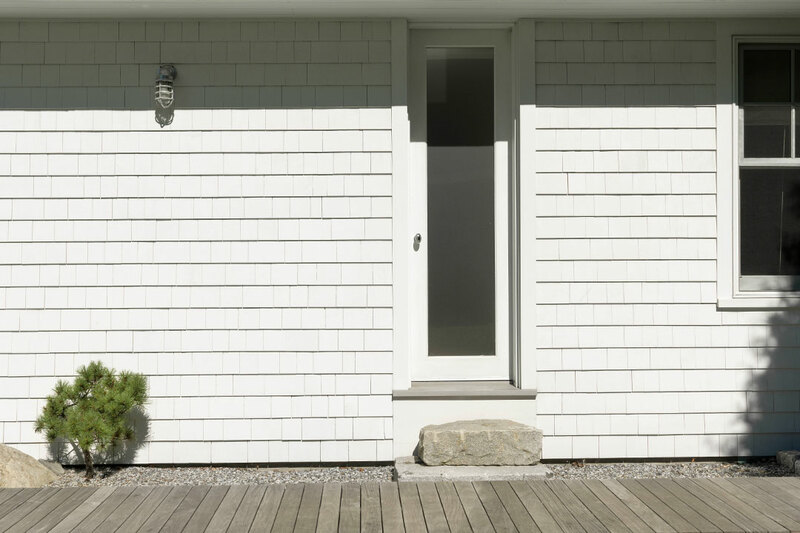 Overlooking Rockport Harbor in Maine, this seaside cottage was designed as a modern interpretation of a traditional Cape Cod. The interior architecture was designed with a minimalist approach with all of the walls and ceilings being lined in ship lap paneling. 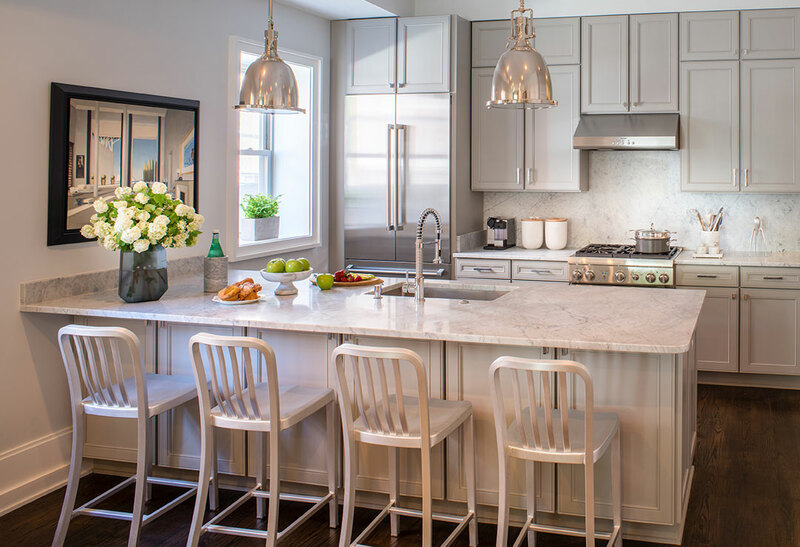 These details created a clean backdrop for an assembly of mid century inspired furnishings whose simple lines complemented the architectural forms. 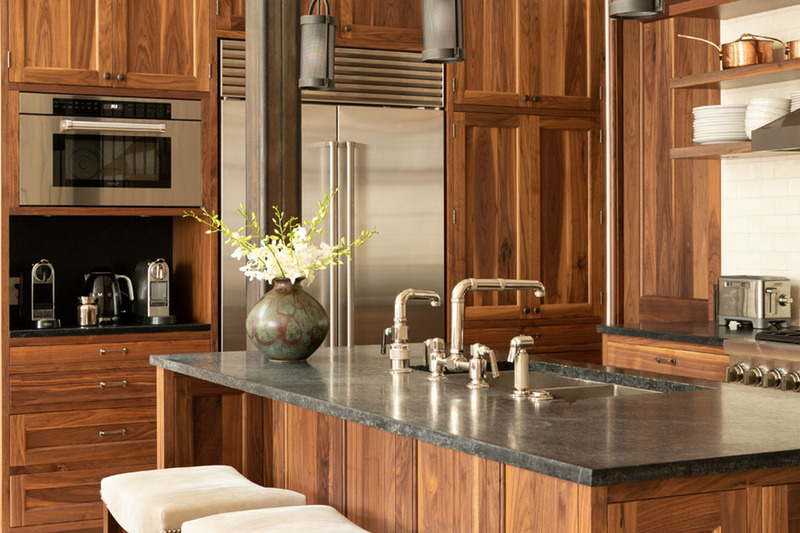 The color palette was designed to celebrate the ethereal light and the colors of the sea and surrounding trees. 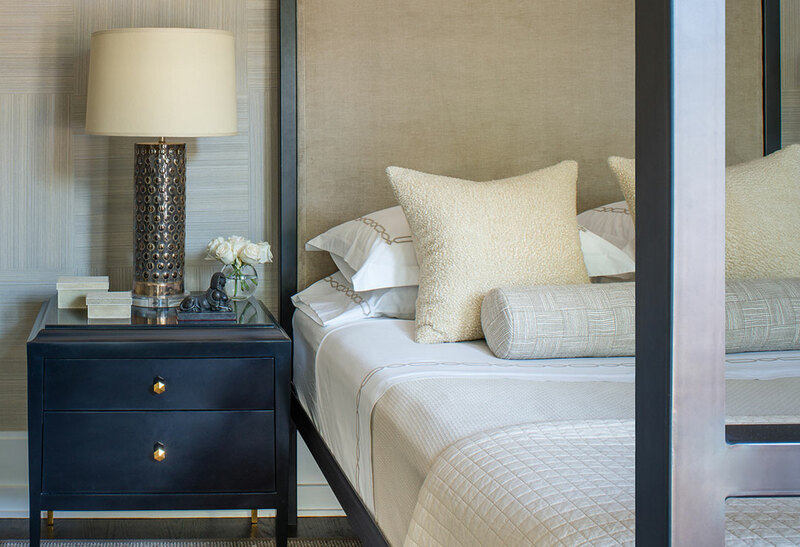 For this stylish and fashion minded client we wanted to create a comfortable, soft and romantic bedroom in neutral tones, and luxurious textures with chinoiserie elements. Creating a backdrop for the assembly of furnishings, we used a hand painted Chinese wallpaper with a soft black background and ivory branches, foliage and birds. 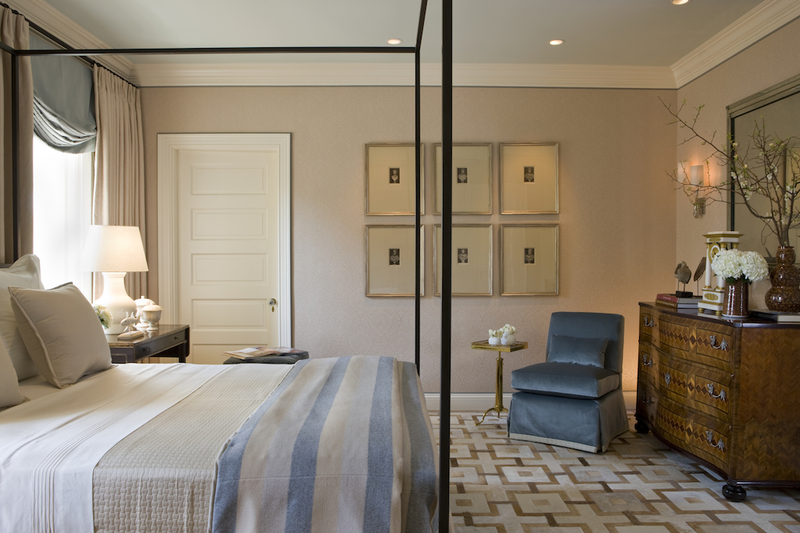 The canopy bed and headboard were custom made in a neutral linen with a silk taffeta lining. The tufted sofa at the foot of the bed was upholstered in a soft cotton velvet with hand embroidered pillows. 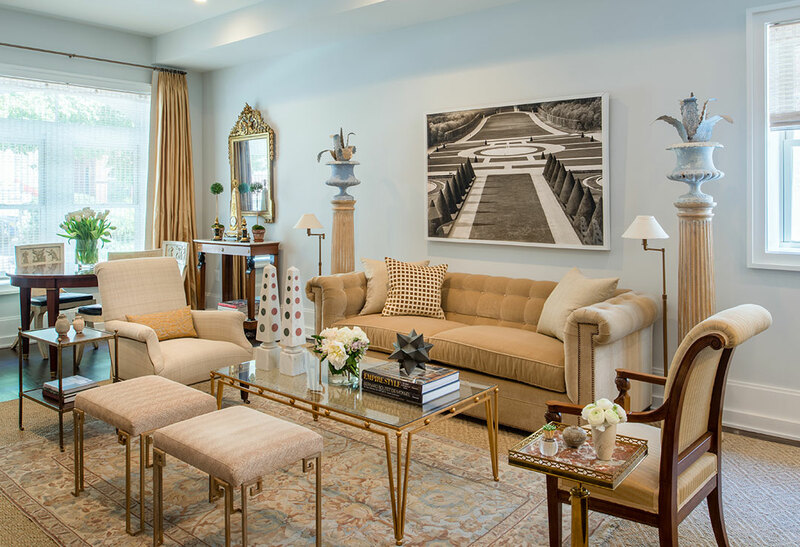 The clients own photography collection added a contemporary note to the room.